I love a jumble sale, and here in the Forest of Dean we still have them in local church halls, mainly in the spring and autumn. My favourite painting subject is the everyday stuff of life, cast off objects that even the other jumblers don't want; chipped china, moth eaten jackets, worn out shoes and once treasured toys. Jumble sales are an endless source of inspiration, I can pick up a perfect still life subject that for 50p prompts an image or a story that leads to my next painting. At this spring's May Hill jumbly my daughter Nancy and I found eight dresses that spanned thirty years of a life.Home stitched in the fashionable fabrics and designs of each decade. 1950's taffeta with bows, sixties and seventies crimplenes and nylon in paisleys and lime greens.I'm going to be needing a big canvas to paint all of these! Sometimes paintings come as a vision, fully formed, out of the blue. Sometimes they need coaxing, an image needs to be shuffled, and shaken down through layers of thought. I'm planning to enter paintings into an exhibition as part of Broadway Arts Festival on a theme of reflections. My friend Jocelyn gave me a collection of vintage gold leaf, folded in brown card, and in little square tissue leaved books. I've been thinking about reflective objects and the glint of gold for a few weeks, with shiny things laid out on my studio bed waiting for an idea to come, but I couldn't get a clear image to form for either an oil or a watercolour, then a few days ago I had a stomp down to the village and back in the rain and decided to just paint my favourite subject, a title of 'The Gilder's Jacket' came to mind and then suddenly I had it ! my reflective gold theme all captured in one painting. Now it's out with the yellows, umbers and siennas and on with the painting!. Here's my little storage shed, rather grandly called 'the packaging shed', it's where I keep cardboard boxes, bubble wrap and a big roll of brown paper. It's also home to spare easels, drawing boards and miscellaneous frames not to mention the nests of wood mice and the occasional robin; It's only really held up by all the teetering piles of stuff inside. I've always loved sheds, the Cedar and dust smell of them, it comes from early memories of Grampy Melve's carpenter's shed and dad's allotment shed. Last week a card in the Post office offered a free shed ! now propped up in our garden. Soon I'll too be busy with demolition and reconstruction followed by artist's storage bliss! I've always shied away from life drawing and portraits. I think all that arms-length pencil measuring put me off. At college in Cornwall we shared a campus with horticultural students, Friday afternoon was life drawing, but I used to sneak off to the green houses to draw the tropical plants. I had to confront my fear of portraits this week, my Wednesday art class wanted to have a go and I like to stay one step ahead of them ! I've had to read up on 'portrait analysis' and come up with a fail safe step by step process of getting from a blank piece of paper to a drawing of a face. 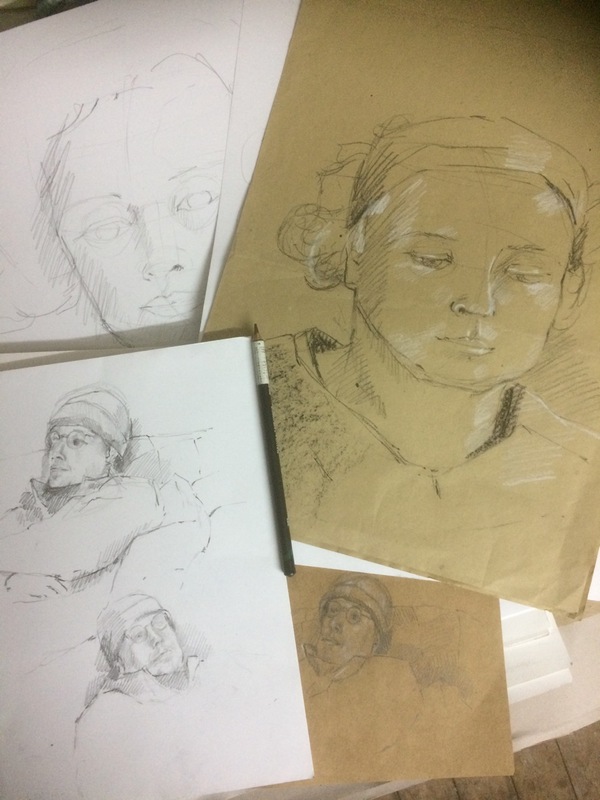 It's turned out to be a good example of teaching giving something back to me, after a few practices I found out that portraits are not so scarily difficult after all ! . Here's my latest small watercolour of flowers in a mug. What wonderful things the hellebores are, they look so delicate and yet they're one of the first, out above the frosty ground in all weathers. Often my first paintings of the year are inspired by the catkins outside the studio window or the daily walk past snowdrops on my way to feed the hens. There's something very pleasing about flowers in a mug, I think for artists it's the contrast between the symmetry and straight lines of a mug or cup and the random loosness of flowers and foliage. We all love to pop a few gathered snowdrops or primroses into a little cup, then up on a window sill or on the kitchen table, a reassurance on cold days that all is waking up in the garden and spring is on the way. Teaching, something I thought I'd find difficult, but it's crept up on me over the last few years. From running an occasional half day workshop in local cafes, to some popular summer painting days in my studio and garden, I now have two local weekly classes. It's become an important part of life that runs alongside my own painting and it's great for me to get out and see other people. It's taken me three years to get to a stage where I can now put on a favourite 50's frock and confidently breeze into a room full of people, de-mystifying art and simplifying the process of making pictures, it's so satisfying to hand out encouragement and cake and see people enjoying painting and drawing and being proud of their results. Hooray ! I can't wait to get back into my studio and start painting, but for now I am at the kitchen table. January has to be the time for some essential paperwork and forward planning, potential exhibitions, tweeks to the website and dates for workshops and art classes. Although we work separately it's really important that my dates don't clash with the pottery year of my partner Nigel, we can't be both pushing our deadlines at the same time, it's crucial that there's always someone keeping calm and making a cup of tea at the right moment. It’s been a while coming together, but now I’m happy with my new website. I’m quite particular about the look of things and I love designing and writing but I do struggle with the technical side. I plan everything on paper, lots of scattered sheets about the house and studio, with sketches and notes. I am immensely lucky that my partner Nigel finds doing complicated things on the computor, easy and even enjoyable! so, he is my translator putting all my ideas onto the screen and knowing just how to layer and arrange everything, and most importantly how to get it ‘Out There’. The hardest part of the new website has been finding time to sit down together, but winter brought us inside and to our desk and the website had the final push that it needed. HOORAY!